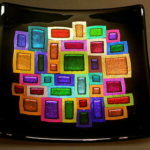 Jane produces a series of fused and slumped glass table top items using dichroic glass as decoration. 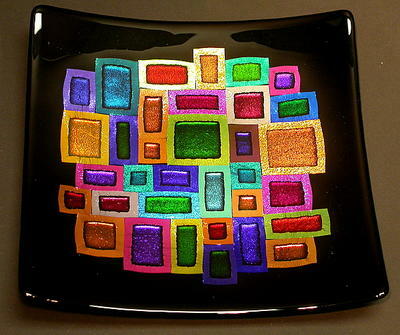 The word dichroic is Greek — di means two and chroic means color. Dichroic glass was developed in the 1960s for use in high technology applications. It manipulates light in two ways, transmitting one color while reflecting another. It appears to change colors when the viewer moves in relation to the piece, providing a kinetic effect. Dichroic glass offers a new dimension to contemporary art glass. 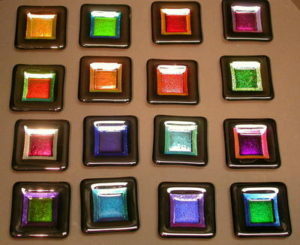 Dichroic glass has been coated with thin films of metals. The metals are evaporated and vacuum deposited onto the glass to such a fine degree of thickness that certain wavelengths of light will pass through and others will be reflected.